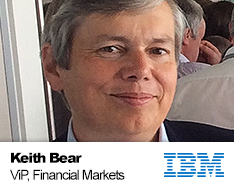 Keith is responsible globally for the strategy and development of IBM’s business in Financial Markets, which is a multi-billion dollar business for IBM. He works extensively with global clients on their major transformation programmes, typically on the cutting edge of shaping IBM’s content and offerings for the Financial Markets industry. He has worked extensively with financial markets infrastructure firms and leading global banks on deployment of Blockchain. He also acts as a Fintech mentor as well as leading partnering activity with Fintechs focused on Capital Markets.